The Conwell Inn is a smoke-free, pet-friendly boutique hotel with the charm and feel of a European bed and breakfast. 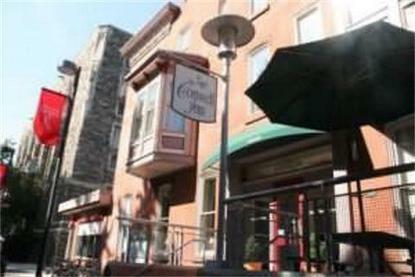 The Inn is located in the heart of beautiful & historic Temple University founded in 1888. Each of our 22 designer rooms are unique and reflect the charm, ambiance and history of the nineteenth century brick & mortar town homes that now house the hotel. Typical architectural features include floor to ceiling bay windows, original moldings and high or arched ceilings. Views of ivy covered gothic buildings and multi-cultural campus life abound from every guest room window. Design features include custom made bedspreads and matching privacy draperies and valances, high end mattresses, solid cherry wood furniture and plushly upholstered chairs. Modern conveniences include a 24 hour front desk, wireless high speed internet throughout the hotel, individual coffee makers, irons and ironing boards, hairdryers and large TV's with premium cable channels (including 4 ESPN and 4 HBO channels). A business desk with a computer, printer and fax machine is available in the lobby. Amenities include a filling hot & cold complimentary breakfast, featuring make-your-own Belgian waffles and afternoon refreshments of either homemade cookies and tea or wine and cheese. The Conwell Inn is less than 10 minutes by car, cab or subway to all of Philadelphia's major attractions including Independence Hall, The Liberty Bell, The National Constitution Center, Center City shopping, The Pennsylvania Convention Center, The Philadelphia Art Museum and the Philadelphia Zoo.